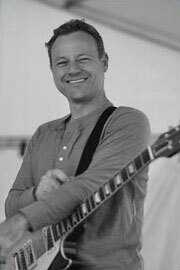 After receiving a Bachelor of Music in Studio/Jazz Guitar from the University of Southern California, Noel moved back to Sydney, Australia where he grew up, and released his first album “Possible Worlds” (1996) and taught at Wesley Institute for Ministry and the Arts. In 1997, he came back to the states to further his study in jazz at the University of North Texas from which he received a Master of Music degree in Jazz Studies (Jazz Guitar Performance). While at UNT, he served as a teaching fellow, was a guitarist for the One O'Clock Lab band, and had many great opportunities to play with well-known artists such as Dave Liebman, Joe Lovano, Adam Nussbaum and Kenny Wheeler. A student band that Noel co-led recorded the album “NJPT” (1999) and was awarded "Best Jazz Instrumental Group" in the Downbeat student music awards. Since graduation, Noel has been actively performing locally and internationally both as a band leader and as a sideman, releasing more of his own albums (“Marshmallow” in 2004, and “Salted Coffee” in 2014) and teaching jazz guitar and improvisation classes as an adjunct faculty member at the University of North Texas. Also, Noel has been active as a recording artist and has performed on dozens of albums. His love for multiple styles of music has enabled him to be involved in a variety of projects including jazz, rock, gospel, pop, country, musical theater and more. Over the years, he has performed and/or recorded with the Dallas Symphony Orchestra, Lucky Peterson, Kenny Wheeler, Gary Willis, Andrae Crouch, Fred Hammond and many more. Noel is a solo artist on his own (4 albums as a leader), but also can be seen and heard as the electric guitarist in the house band of the “Daystar” TV network's “Marcus & Joni Show” (daily live show), at Bethesda Community Church (Fort Worth, TX), and in various other sideman projects throughout the DFW area. Noel teaches at UNT and at Lone Star Music Academy, a music school he and his wife co-founded. He is a family man and a proud dad of two sons.